The rise of the Internet of Things (IoT) has caused stratospheric growth in the number of connected devices and sensors in enterprises across all industries. It’s estimated that more than 80 things per second are connecting to the Internet, and by 2020 there will be 50 billion things connected to the IoT. Industries such as manufacturing and retail are being dramatically transformed by the IoT, with enterprises adopting technologies like fog computing and advanced analytics, or deploying hundreds of thousands of sensors throughout every aspect of their supply chains to create efficiencies, increase productivity and gain real-time insights about their customers. See also: Can connected cars unlock the key to advertising dollars? The connected car market today is facing many of the same IoT-related challenges that enterprises in other industries have already encountered and overcome. Having helped enterprises in many other industries deploy IoT-enabled technologies and processes, I’d like to take a look at some of the best practices and lessons learned, and explore how they can be applied to the connected car market to help automakers and their partners harness the full potential of the IoT. In many ways, the connected car can be considered the ultimate “thing” in the IoT. With more than 100 onboard computers continuously monitoring location, component performance, driving behavior and more, experts estimate that highly automated vehicles will generate four terabytes of data per day. They are truly data centers on wheels and the epitome of everyone’s best hopes and greatest challenges when it comes to the IoT. And as our transportation systems become even more connected through vehicle-to-vehicle (V2V) and vehicle-to-infrastructure (V2I) communication, the amount of data generated is going to shift into overdrive. 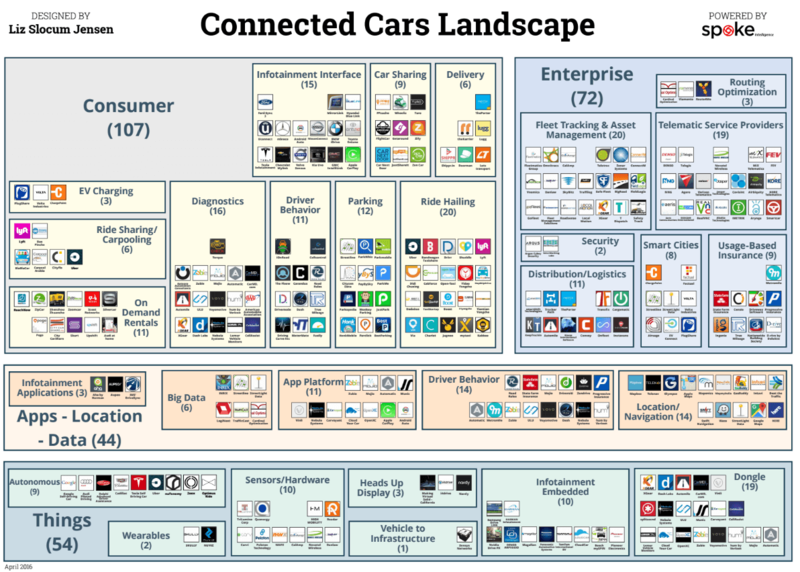 As a result, automakers and their partners are beginning to experience many of the same challenges that enterprises in other industries have, including managing an overwhelming number of connected devices and the huge volume of data they generate, as well as challenges related to security, pervasive connectivity, optimizing bandwidth and more. In enterprises across many industries, the trend of letting employees connect their personal smartphones to the enterprise network (known as “bring your own device” or BYOD) created significant challenges for IT departments. Not long ago, enterprise IT revolved around managing a few large mainframes. Then suddenly, the emergence of new paradigms like client-server, distributed and mobile computing forced enterprise IT to evolve. IT professionals became responsible for managing not only numerous machines, but also a huge number of potentially un-secured personal devices connecting to the network. The situation today in the connected car market is very similar. At first the number of Internet-connected cars was very small. But today, as the number of sensors and electronic control units multiplies, the connected car operates like a data center on wheels or even a small city. Myriad different entities each transmit potentially different types of data to different destinations, with different purposes, privacy and security requirements. The diversity of suppliers of these parts further complicates the ecosystem. Multiply this by the skyrocketing numbers of connected vehicles (more than 380 million connected cars are expected to be on the road by 2021), and the challenge of managing all these connected devices becomes significant. Just as in the enterprise, traditional approaches won’t work, and a new paradigm is required. Take for example, a typical retailer. 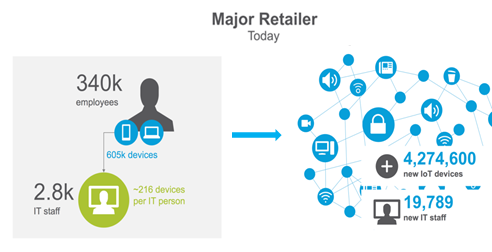 Traditionally, enterprises have been able to manage up to about 200 devices per IT staff member but with the rise of the IoT, retailers now need to manage not just a few hundred thousand devices, but millions. Using traditional IT approaches, this would require adding tens of thousands of IT staff! Clearly this won’t work, so we need a different approach. 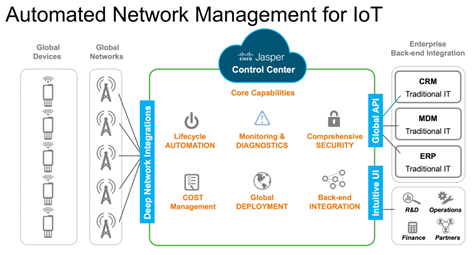 Fortunately, we are entering the era of automated network management, where intelligence in the network can provide lifecycle automation, monitoring and diagnostics, continuous learning, and even self-healing. This should ultimately lead to the ability to manage more than 1 million devices per IT staff (Figure 2). A single pane of glass brings it all together into a consolidated view. With this approach, a connected car automaker or other original equipment manufacturer (OEM) can see at a glance how each individual part is performing across a fleet of vehicles, indicating where there are opportunities for improvement in security, reliability, or even new features, for example. Another challenge that comes with the growing number of connected vehicles is how to manage changes and software updates for their many related components and applications. The average vehicle today has more than 100 million lines of code under the hood, but the amount and complexity of software in vehicles is poised to explode as advanced driver assistance features and highly automated driving begin to take off. Likewise, as connected cars bring more new experiences to drivers and passengers, both the vehicles and the policies that govern their use will become more complex and personalized, making management of widely-varying configurations daunting. Today, most vehicles receive software and configuration updates in the repair shop, so updates are less frequent and more readily bundled into packages that have passed a rigorous battery of quality assurance and safety tests. With over-the-air (OTA) updates, however, automakers can push new software and configurations to vehicles immediately, performing repairs on the spot without the need for a service appointment, patching vulnerabilities immediately, and satisfying consumer demand for new features at the moment when they are most primed to purchase. Making sure all these updates are compatible and will function with existing code in the car is a significant undertaking. Fortunately, lessons from enterprise IoT software management can be applied here as well. An automated toolchain that facilitates regression testing and testing large numbers of variations in software packages can streamline the process of ensuring that more frequent and granular updates to in-vehicle technology don’t cause problems. Keeping track of all the versions of software deployed to different models of vehicles with different configurations (including after-market equipment) requires a highly automated version control system that manages the testing, signing, delivery and validation of successful installation. Likewise, managing all the variations of in-vehicle network configurations is greatly simplified by a cloud-based controller. Just as enterprises in other industries have learned that centralized management, visibility and control of their networks enables them to more easily manage the growing number of connected devices, a cloud controller for in-vehicle networks can simplify configuration changes to connected cars. When integrated with the single pane of glass described above to manage the vehicles and their devices, the automated toolchain and cloud controller enable the automaker to manage the complexities of version control in the software-defined vehicle. As connected cars continue to grow in popularity, another major challenge automakers face is security. Given all the data that connected cars can collect – everything from biometric and behavioral data on drivers and passengers, to purchasing habits when the vehicles are used to automatically pay at gas stations and drive-throughs – there are implications for both privacy and safety if the vehicle is not properly secured. On the enterprise side, as organizations have increasingly adopted IoT, they have wrestled with the potential new vulnerabilities of a greatly expanded attack surface. Everything from an employee’s smartwatch to an organization’s IoT-enabled lights or security cameras can be turned into an attack vector. In the era of the IoT, enterprises have learned that there is no longer a security perimeter within which devices can be trusted – the IoT truly spans the globe and ecosystems of enterprises, even across industries. This requires a new approach to security, with defense in depth distributed from the cloud to the edge, as well as intelligence in the network to detect and stop threats before they propagate. Because the connected car is perhaps the ultimate “thing” in the Internet of Things, automakers are facing similar challenges. The attack surface in a connected vehicle is truly enormous – cellular, Wi-Fi and even satellite connectivity between the car and the cloud, as well as V2V and V2I connectivity that cars use to communicate with each other and roadside infrastructure can all be hacked. Not to mention Bluetooth, near-field communications, and physical connections to the on-board diagnostics port under the dash. Even the wireless signals from the Tire Pressure Monitoring System to the head unit can be hacked. To secure this huge array of attack surfaces, automakers and their partners in the connected car ecosystem can adopt many of the principles and best practices that enterprises have used to strengthen security for the IoT. The convergence and consolidation of disparate networks in the vehicle to an Internet Protocol (IP) over Ethernet backbone is one important step in strengthening security. With in-vehicle networking standardized to IP, proven security technologies from encryption and authentication to firewalling and intrusion detection and prevention systems (IDS / IPS) can be deployed to give the connected car its own defense in depth. Artificial intelligence is also being deployed more frequently both in the enterprise and now in connected vehicles to learn to detect new patterns of malicious behavior (or even non-malicious anomalies that could be early warnings of the need for maintenance). Another key to securing all these potential attack surfaces is to enable the right levels of connectivity at the right times throughout the vehicle’s lifecycle. Much like how enterprise IT security teams have learned to continuously monitor their network access and IoT-enabled devices in order to spot anomalies, automakers will need to continuously monitor and manage connectivity for their vehicles. They must know when connectivity for the vehicle should be on or off and what the vehicle should be allowed to do with that connectivity at different stages of its lifecycle. For example, during the vehicle testing phase, connectivity must be “on” so automakers can verify that connected services are properly functioning. Then, when the vehicle is in its shipping container, the manufacturer can automatically disable these services to prevent hackers from sabotaging the vehicle while it is en route to the dealership. All the while, some connectivity must remain on to enable real-time tracking of the vehicle during its journey. When the vehicle arrives at the dealership, an automated system allows automakers to safely resume connections so salespeople can demo the vehicle and its connected services to the buyer. For an automaker shipping millions of vehicles around the world, tracking and monitoring this connectivity would be a complex task, but by leveraging the IP over Ethernet backbone and centralized management through an IoT connectivity management platform, automakers can automate it all. As enterprises in other industries began adopting more IoT-enabled processes and placing an increasing number of sensors throughout their networks, they quickly realized that IoT presents several resource challenges. Not only are the devices themselves constrained (so that their applications need to be designed to make very efficient use of storage, compute, bandwidth and power), but the sheer number of devices connecting can generate an avalanche of data, overwhelming networks and storage. Even before the IoT began to expand, proliferation of servers gave rise to a surge in virtualization, which greatly economized compute and storage resources in the enterprise. Connected cars face many of the same challenges. Cost is an enormous factor for automakers looking to add new capabilities, energy is a precious commodity, and with regard to vehicle weight, every ounce counts. Moreover, four terabytes per day is vastly more data than a car can transmit over a cell tower network at any reasonable cost today! Nevertheless, highly automated vehicles demand more of these resources. Here again, some enterprise IoT strategies can be leveraged. For example, while it would be nice to have all those terabytes of data from every vehicle available in the cloud as they are generated, some parts of that data are much more relevant than others. Moreover, some of the data is very time sensitive and some is not. Many connected vehicles have data plans where the data rate is cheaper at night, so determining when to send data is valuable. An IoT connectivity management platform can apply intelligence to determine which telematics data needs to be sent or which applications need to be connected at a given moment, and which can wait until nighttime for a preferable data rate. Likewise, the rise of fog computing in the enterprise (the practice of bringing the cloud to the edge with distributed compute and storage) enabled intelligent filtering and adaptive compression by IoT devices and gateways, thus reducing the amount of data that needed to be sent to the cloud. That same local processing in the vehicle, together with configurable rules about what data to send immediately versus what data to store and forward, can dramatically improve the effective use of mobile bandwidth in connected cars. This edge processing and connection management can be handled efficiently from the cloud, as discussed above. Weight is also a paramount concern for OEMs looking to improve energy efficiency. Standardizing to Ethernet for in-vehicle networking can reduce wiring weight by as much as 50 percent or 50 pounds in an average sedan, helping improve fuel efficiency and lower installation cost. Finally, the “data center on wheels” can borrow another page from the enterprise data center notebook through the use of virtualization. With an efficient, elastic, centralized compute and storage device, dozens of electronic control units throughout the vehicle can be streamlined, reducing cost and complexity by virtualizing some of their common logic. This also paves the way for a more service-oriented architecture in the vehicle, increasing agility to create new applications and services, reducing manufacturing and maintenance cost and improving quality. Lastly, but perhaps most importantly, the era of the IoT calls for rapid iteration and testing many ideas to see what works best and what delivers business value. Because of the radical reengineering, IoT enables and because of the nearly limitless possibilities, rapid iteration and testing is especially important in the early stages of IoT, where results are often unpredictable. The automotive industry has been accustomed to a more lengthy and predictable cycle of innovation, planning major releases for new vehicles up to five years in advance and spending years testing every aspect. But because we’re still in the early days of both IoT and connected car adoption, it’s not always clear where a business will get the most value for their technology investments. Automakers should, therefore, consider rapid prototyping to test new ideas quickly. They should also adopt a flexible, extensible architecture to shorten development and unit testing cycles since the rigorous road testing cycles are more difficult to compress. 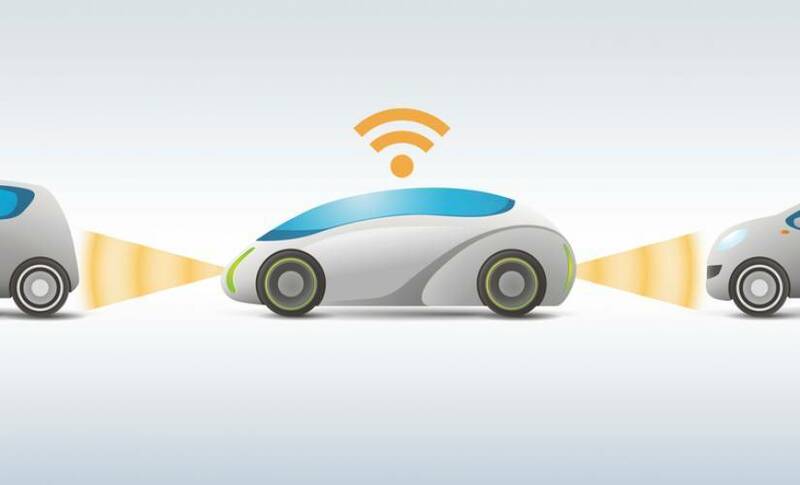 An IP over Ethernet backbone network can make connected car architecture much more agile, allowing automakers to attach new sensors, actuators or other devices, analyze the data, measure the value and make adjustments very quickly. By reducing both the time to confirming valuable new features and the development and unit testing time, automakers can significantly shorten the innovation cycle to roll out industry leading new releases. The IoT is transforming enterprises in every industry, but the connected car is still in the early days. Fortunately, automakers can take many of the best enterprise IoT practices and apply them to connected cars in order to meet many similar challenges, including managing the complexity of a large number of connected cars each with myriad connected parts, ensuring security and optimizing bandwidth, computing capacity, weight, and energy. This will help the automotive industry move to a future where vehicles will communicate with the cloud, each other and the infrastructure around us to deliver a safer, more efficient and altogether superior transportation experience.